Copper nanowires have been synthesized at different pH values through the template assisted electrodeposition technique using polycarbonate track-etch membranes as scaffolds. The effect of pH (0.8–2.8) of the electrolyte on structure, morphology, composition and deposition rate of copper into the pores of the template, while keeping other electrochemical conditions same, was investigated. X-ray diffraction analysis confirmed the face centered cubic phase of synthesized nanowires. With the change in pH, no shift in peaks was observed except the inclusion of an additional peak of copper oxide in nanowires synthesized at pH 2.8. The nanocrystallite size, strain, lattice stress and energy density were evaluated by X-ray analysis. Field emission scanning electron microscopy images revealed that nanowires obtained at pH 0.8, 1.1 and 1.4 showed incomplete deposition in the pores of the membrane whereas, the nanowires obtained at pH 1.7 were densely stacked, vertically aligned and uniform along the diameter and that obtained from pH 2.0–2.8 had overdeposition on their top. An increase in deposition rate was observed with the increase in pH value. The average diameter of Cu nanowires was found to be ~ 105 nm. The electrical conductivity of as-grown nanowires was observed to decrease 13-fold as the transition from bulk values to the nanosystem. Nanowires prepared at pH of 1.7 were characterized for their field-emission properties. 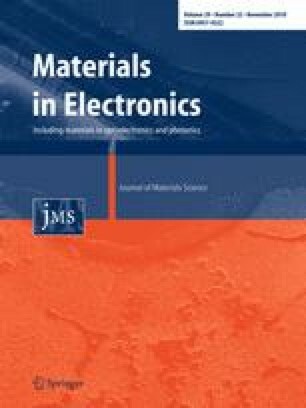 A very large field-enhancement factor of ~ 10,855 was obtained indicating that Cu nanowires grown by reported technique shows outstanding potential as efficient field-emitters for flat panel displays. One of the authors, Dr. Rajesh Kumar is grateful to University Grants Commission (UGC), Govt. of India, New Delhi, India, for providing financial assistance as Raman Post-Doctoral Fellow (F.No. 5-150 /2016(IC)) at Rensselaer Polytechnic Institute, New York, USA. We would also like to take the opportunity to thank all the reviewers for their effort and expertise in reviewing this paper that has helped in further improving the quality of the research paper.